A few years ago, Portugal as a whole was an under-the-radar destination in Europe. It was affordable to visit, had relatively warm weather year-round, and was home to great food and wine – and yet nobody really seemed to know about it. Well, the secret is out, guys. Today, Portugal still has a great climate and that good food and wine. It's still one of the most affordable countries to visit in Western Europe. But, it's certainly not under-the-radar any longer! 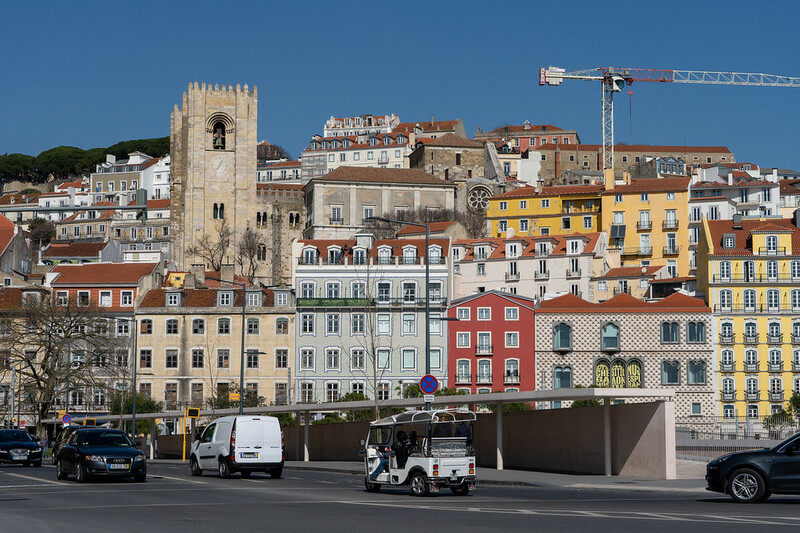 Lisbon has become an extremely popular spot for city breaks in Europe. Budget airlines fly there from all over Europe, and you can even find very affordable trans-Atlantic flights from the US. It's also an increasingly popular cruise ship port. Which means that Lisbon is by no means the quiet Portuguese capital that it once was. 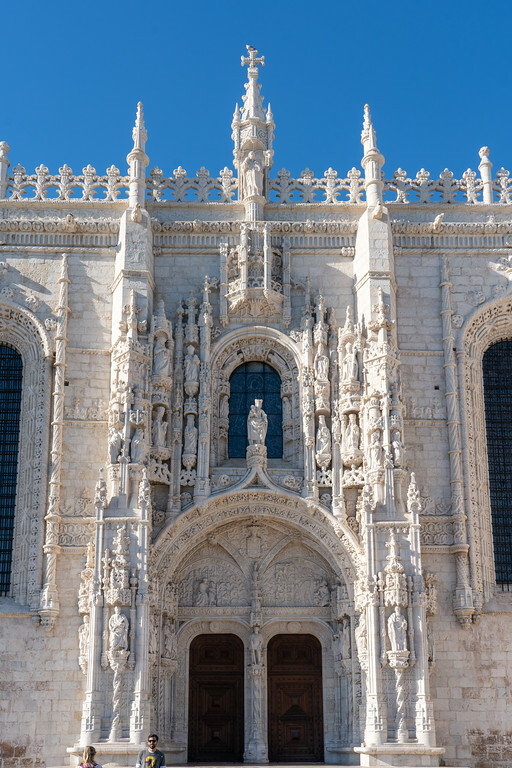 It's no surprise, really – Lisbon is amazing! The internet probably doesn't need another “things to do in Lisbon” post. But guess what? I'm going to write my own version of it anyway since I *finally* visited Lisbon for the first time earlier this year! 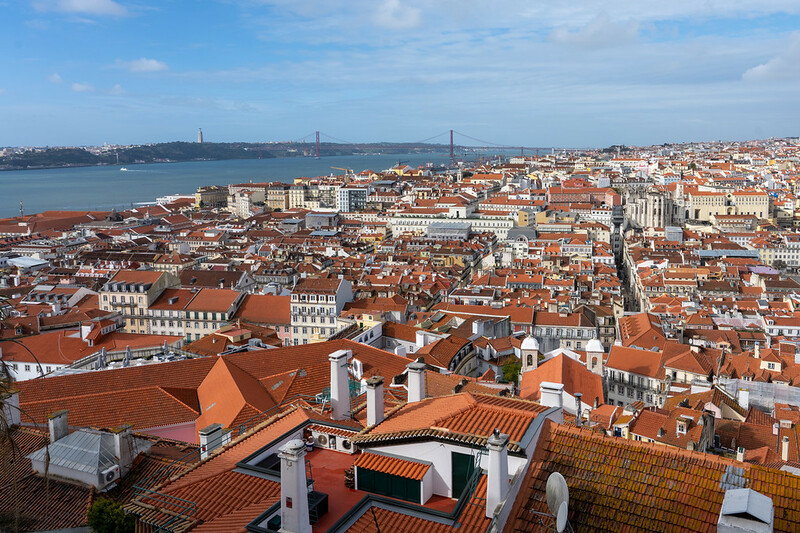 Lisbon is home to more than 500,000 people and is the capital of Portugal. Lisbon is one of the oldest cities in Western Europe – older than other capitals like London and Paris and even Rome. 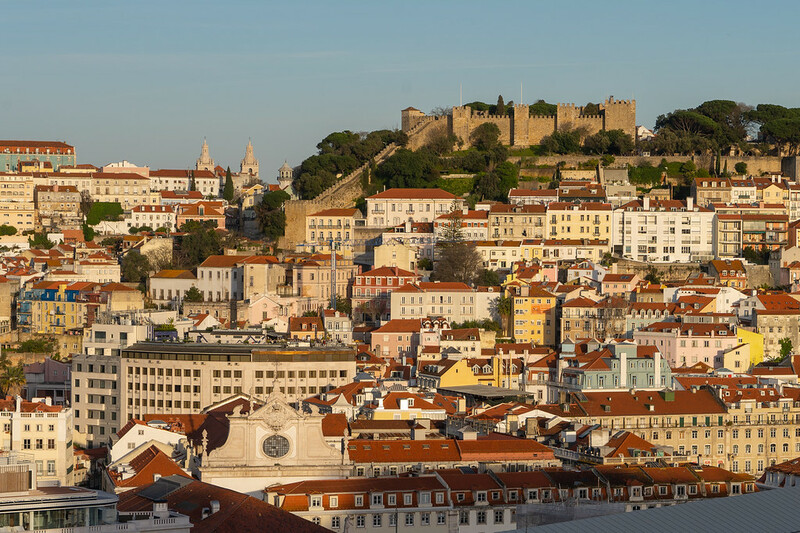 Like many other great cities, Lisbon was built on seven hills (so be prepared for lots of uphill walking!). Lisbon sits at the mouth of the Tagus River, the longest river in the Iberian Peninsula at more than 600 miles long. The city is one of the sunniest in all of Europe, averaging 2800 hours of sunshine per year. If you're planning to visit Lisbon for the first time, you really need at least a long weekend in the city to hit all the highlights. 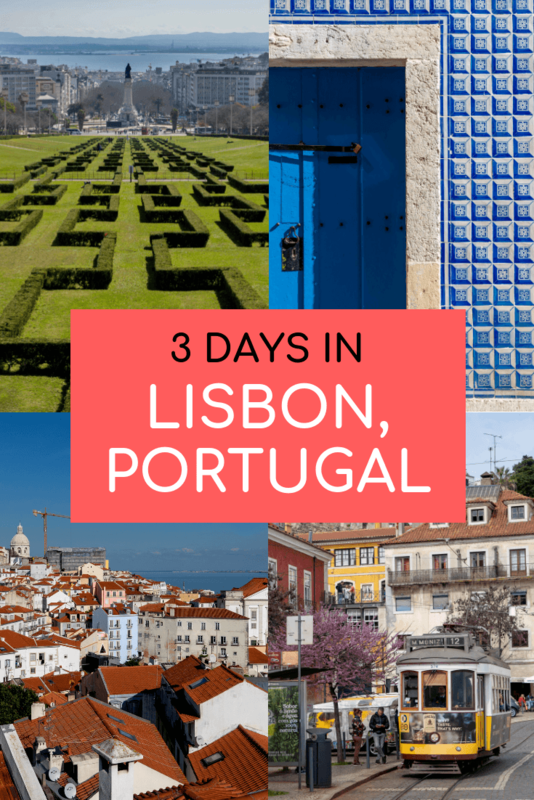 With 3 days, you can see the best of Lisbon without rushing too much. 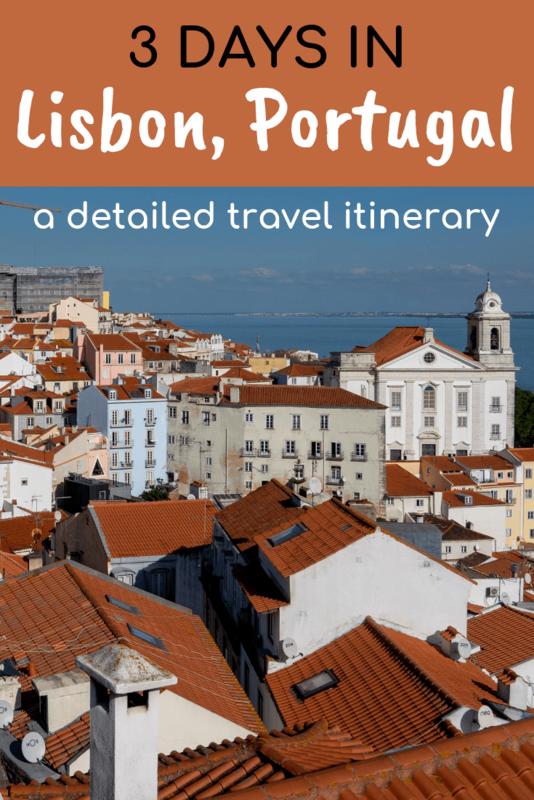 I'm grouping this itinerary by neighborhoods, and the best place to start your exploration of Lisbon is in the Alfama neighborhood. 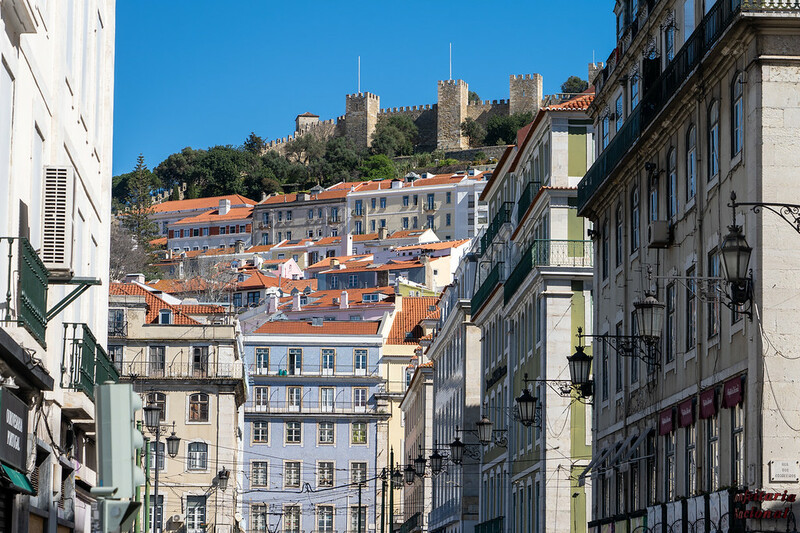 This is the oldest part of Lisbon, where tiled buildings are perched along steep cobbled streets that stretch from the Sao Jorge castle to the Tagus River. This neighborhood used to BE the entire city before Lisbon was Lisbon. It has a strong Moorish influence (the Moors ruled here for centuries before the Catholics came), and its name Alfama actually comes from the Arabic word “al-hamma,” meaning baths or fountains. The Alfama district is also one of the only parts of Lisbon that wasn't completely destroyed by the devastating Lisbon Earthquake of 1755. So, as you can imagine, there's a LOT to see here. 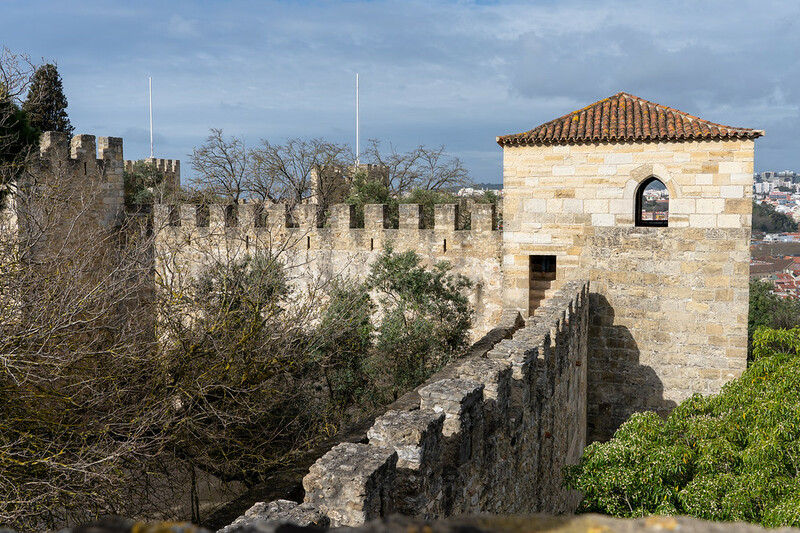 If visiting medieval castles and fortresses is of interest to you, then you'll want to start your morning at Castelo de Sao Jorge, the castle that sits imposingly atop one of Lisbon's hills above the Alfama neighborhood. This castle is one of the top attractions in all of Lisbon, meaning I recommend getting there within an hour of opening time (or right when it opens if possible). If you get there any later, you'll be met with a line to buy tickets, and crowded walls and ramparts inside. If I'm being completely honest, I wasn't *super* impressed by the Castelo. I mean, the views out over Lisbon from the castle's miradouro (literally, scenic viewpoint) are incredible, and walking the ancient castle walls was pretty cool. 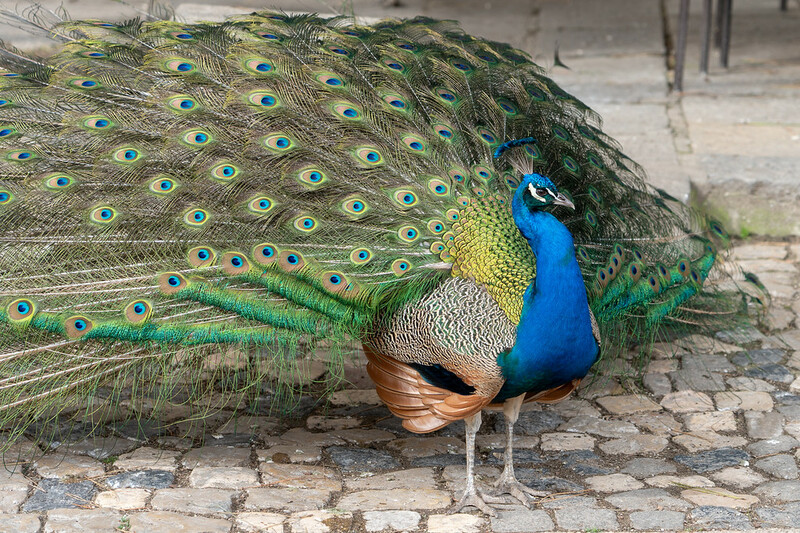 And there are lots of peacocks. BUT, there aren't any other castle-y things to see, or any interior rooms to visit. So you're basically paying 11 Euros to walk along the fortress walls and see the views. Walking the castle walls is the coolest part of visiting. And the views from the castle walls are nice. The views are great, yes, but you can see similar views for free elsewhere in Lisbon! So this is one thing you can probably skip if it doesn't appeal much to you, or if you don't feel like getting up early to get there at opening time. Whether you decide to spend a couple hours at the castle or skip it entirely, the other spot I recommend visiting in the morning in Alfama is the Miradouro da Graça, my favorite viewpoint in Lisbon. You can walk here from the Castelo in about 10 minutes. This spot is officially known as Miradouro Sophia de Mello Breyner Andresen, named for the church that sits on one side of the viewpoint (and this is how it shows up on Google Maps). My favorite view in Lisbon! 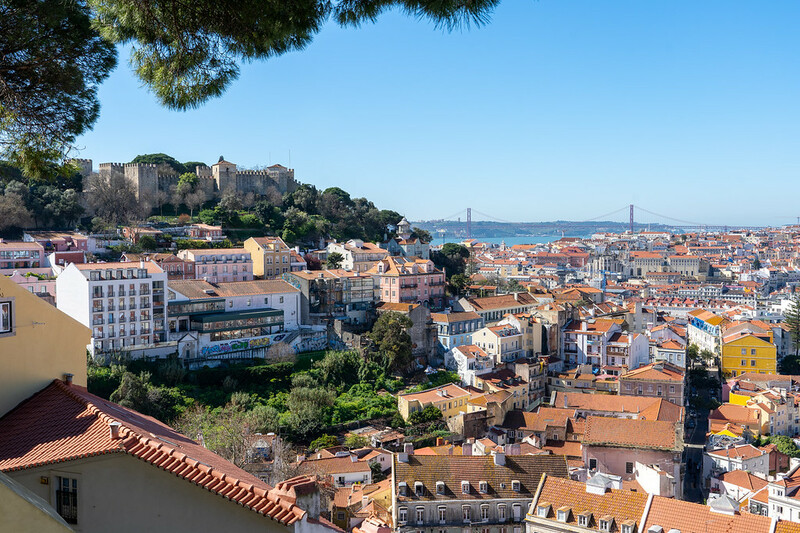 The miradouro offers up fantastic views of Lisbon (including the Castelo), and a small outdoor cafe makes it the perfect place to sit in the sun and enjoy a late-morning coffee. 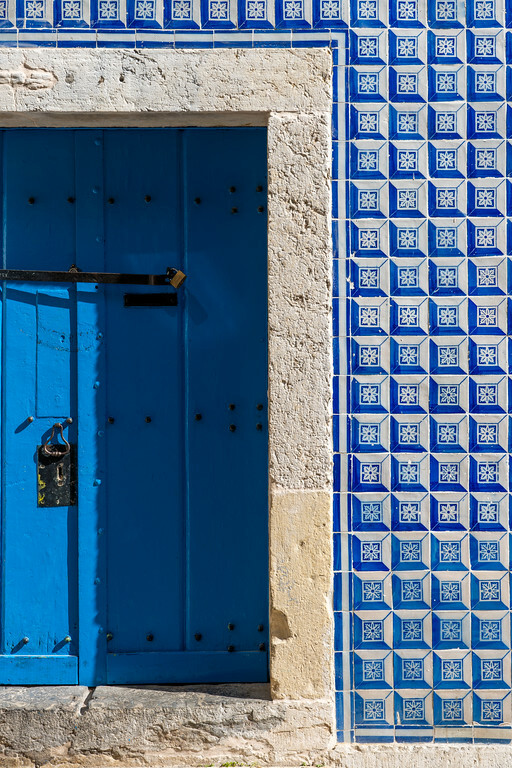 The Alfama neighborhood is an excellent place to just wander and maybe get a little lost. Start walking downhill, keeping an eye out for a terrace or outdoor patio that speaks to you for lunch. If you want a couple suggestions, Le Petit Cafe and Maruto Bar & Bistro are highly-rated in this neighborhood. I also had a lovely light lunch at the funky Pois Café. 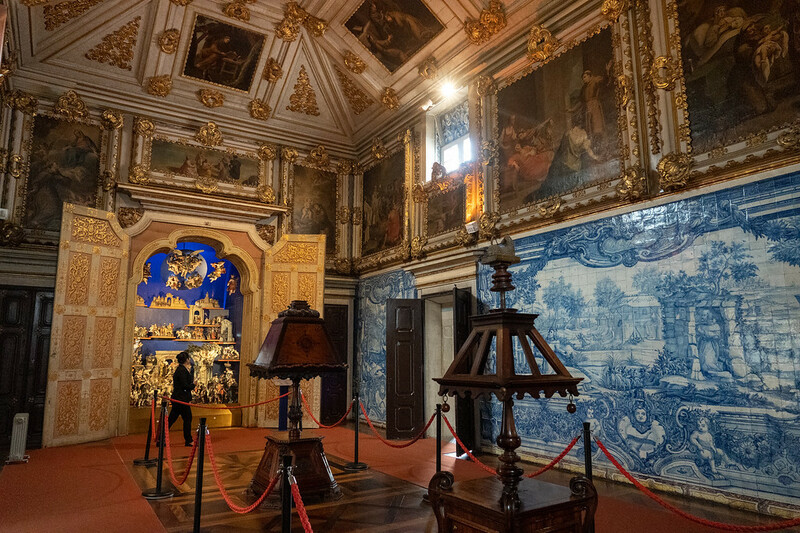 After lunch, make your way down to the Museu do Fado, or Fado Museum. Fado is a famous musical style associated with Portugal. It's an expressive, often melancholy type of music that's usually accompanied by guitar. The Fado Museum will walk you through the evolution of this style of music – a must if you plan to attend a Fado show while you're in Portugal! After getting your fill of Fado, it's time to head back up the hills into the heart of Alfama for more views and perhaps a sunset cocktail. Two additional miradouros you should visit are Miradouro de Santa Luzia and Miradouro das Portas do Sol. These two are best visited in the late afternoon/early evening, when the sun will be shining on Lisbon's orange-hued rooftops. 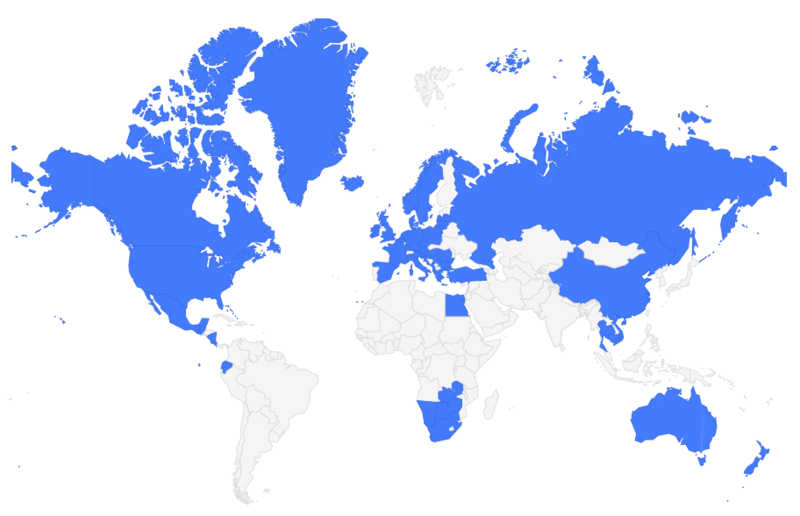 They're also located virtually right next to each other. 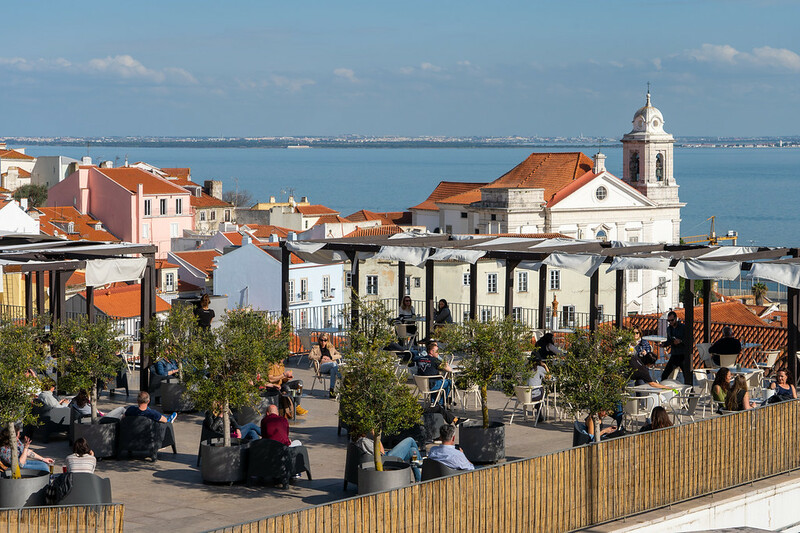 I would start at Miradouro de Santa Luzia for some photos, and then try to snag a table at Portas do Sol, the terrace restaurant that overlooks the Tagus River. This is THE spot to grab a relaxing sunset cocktail. 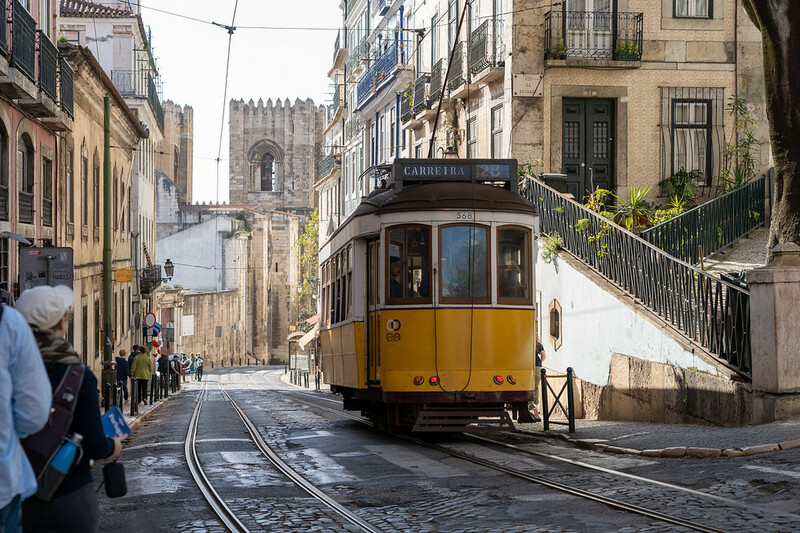 NOTE: Almost every Lisbon itinerary you'll read will tell you to ride the famous Tram 28 in Alfama, which you'll see stopping near Portas do Sol. Sure, this tram is historic and iconic. But it's usually crowded, hot, and one of the spots you're most likely to get pickpocketed in Lisbon. If you want to ride a tram in the city, there are others that I'd recommend over Tram 28. 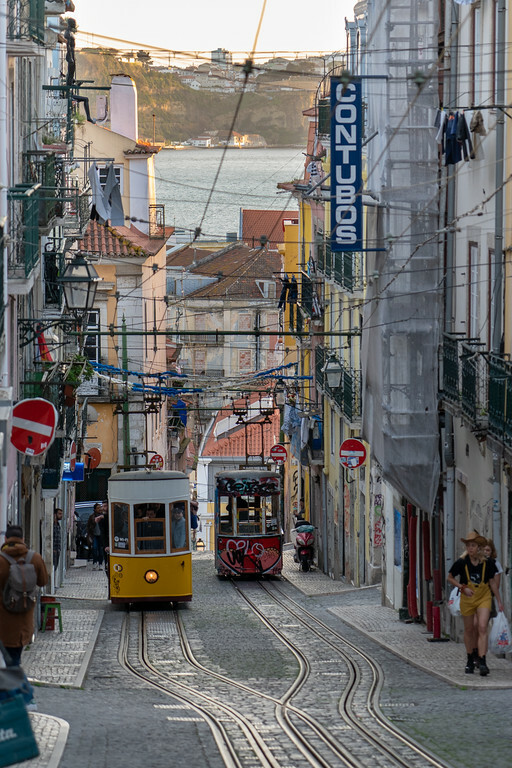 This one is almost exclusively “the tourist tram,” and I'd tell you that walking or taking an Uber around Alfama will almost always be faster and more comfortable. OR, tonight would be a great night to go to a Fado show, as there are several good spots right in Alfama, or in nearby Chiado. If you'd like to roll everything into one experience, check out this private tour: Lisbon Sunset Walking Tour with Fado Show and Dinner. On your second day in Lisbon, it's time to check out the other top spots in Lisbon, mostly in the Baixa-Chiado area. I remember seeing photos of this park online before I started planning my first trip to Lisbon. I had previously seen photos of the tiled houses and steep Alfama streets, but I hadn't known that Lisbon also had such huge green spaces! Start your morning at Parque Eduardo VII, to the north of the Avenida da Liberdade and Marques de Pombal Square. 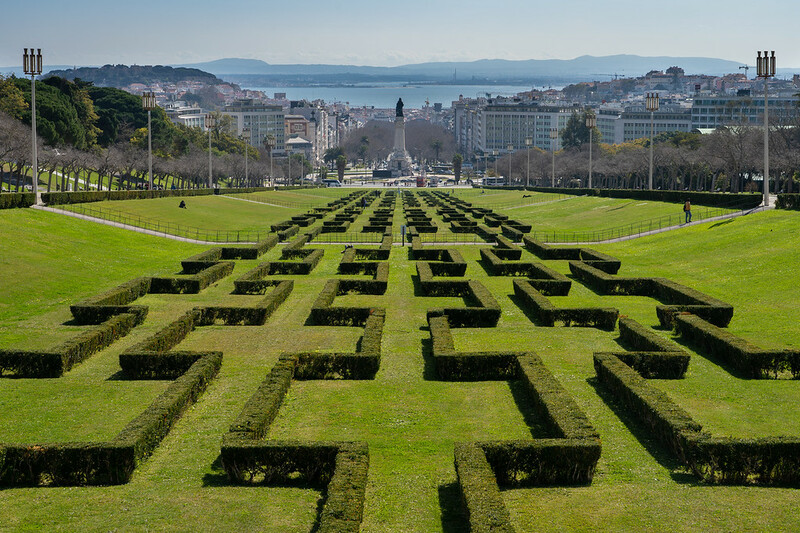 Walk to the very top of the park, where you'll find incredible views back down the manicured lawns toward the Tagus River. 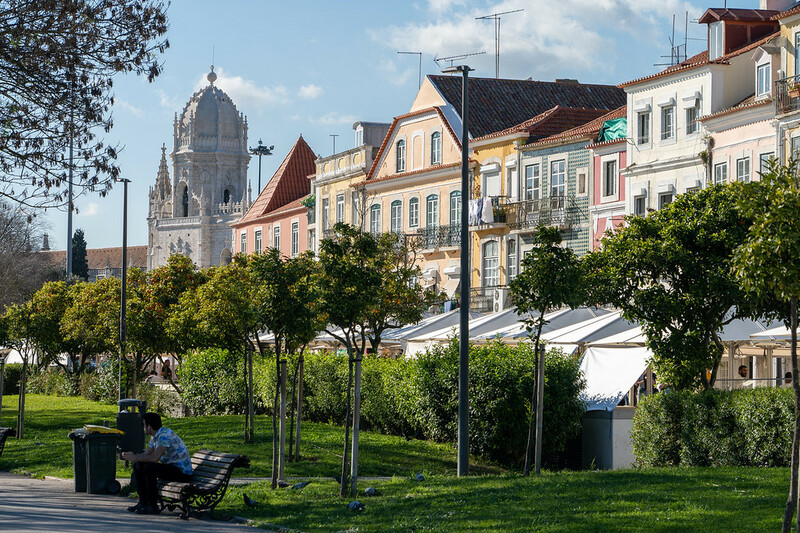 Afterwards, you can continue into the Jardim Amália Rodrigues across the street, perhaps stopping at the Linha d'Água for a coffee or snack. 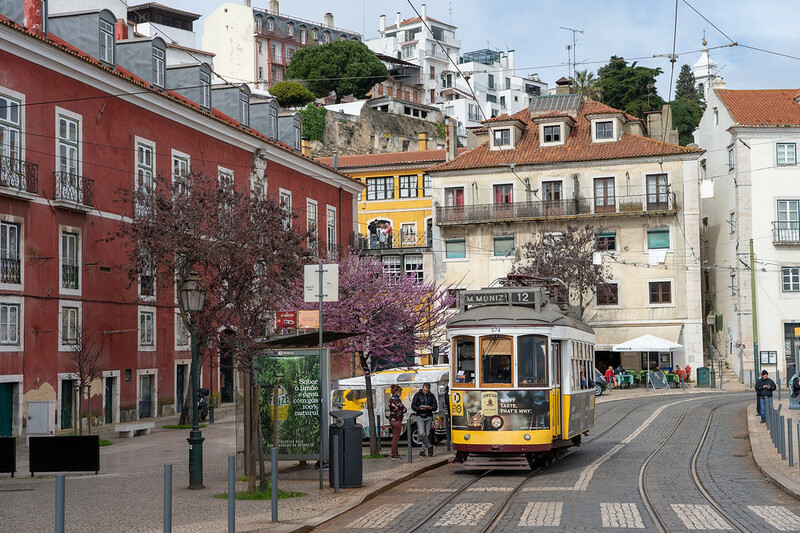 To get to the Baixa-Chiado neighborhood from the park, you have two options: hop on the metro to Rossio station, or walk straight down the Avenida da Liberdade. Walking to Rossio Square will take you about half an hour. 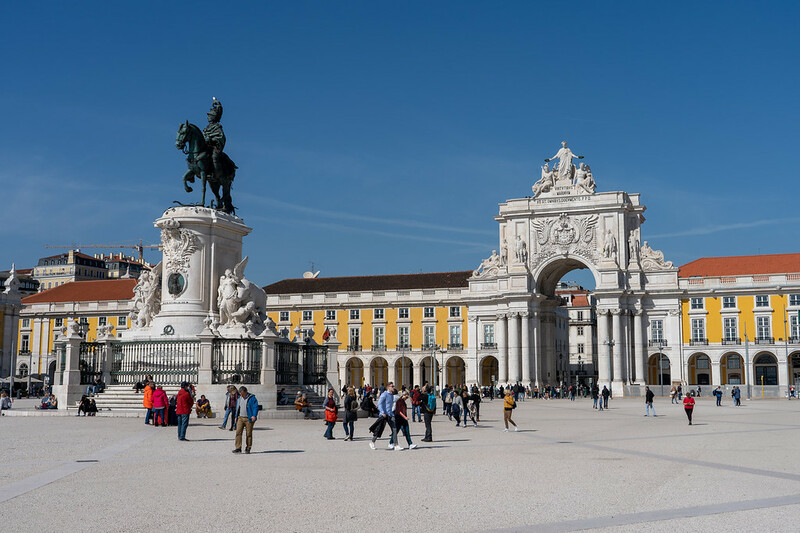 From Rossio Square, you can walk down the pedestrian-friendly Rua Augusta, which will spit you out in the famous Praça do Comércio, or Commerce Square. Along the way, you can stop to see the Santa Justa Lift (an outdoor elevator), and grab lunch. There are TONS of lunch options in this area. I would avoid the outdoor spots right on Rua Augusta, and at Commerce Square, though – they're your typical touristy spots that are going to be mostly overpriced and not that great. Go over a street or two, though, and you'll find plenty of options. I had a tasty lunch one day at BEHER LISBOA (an incredible jamon shop), and a good burger at The B Temple. 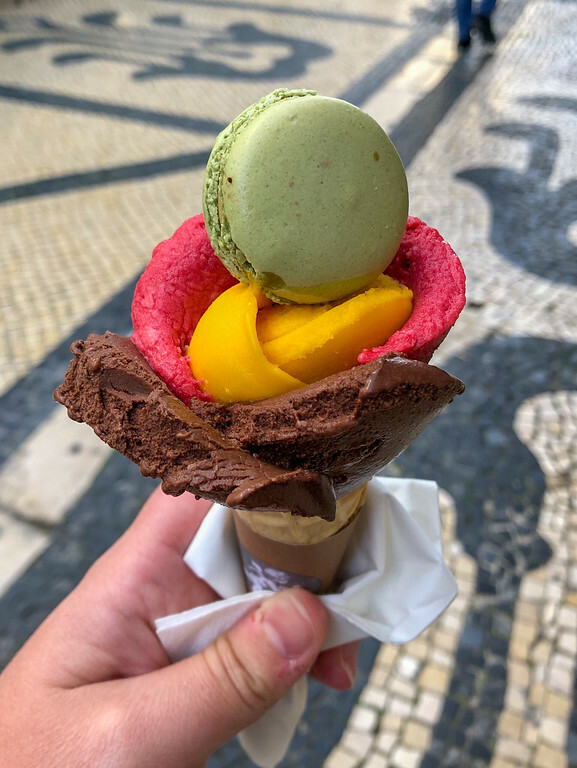 For a sweet treat, hit up a bakery for a pastel de nata (the famous custard tarts of Portugal), or stop in to Amorino Baixa for a fancy gelato. 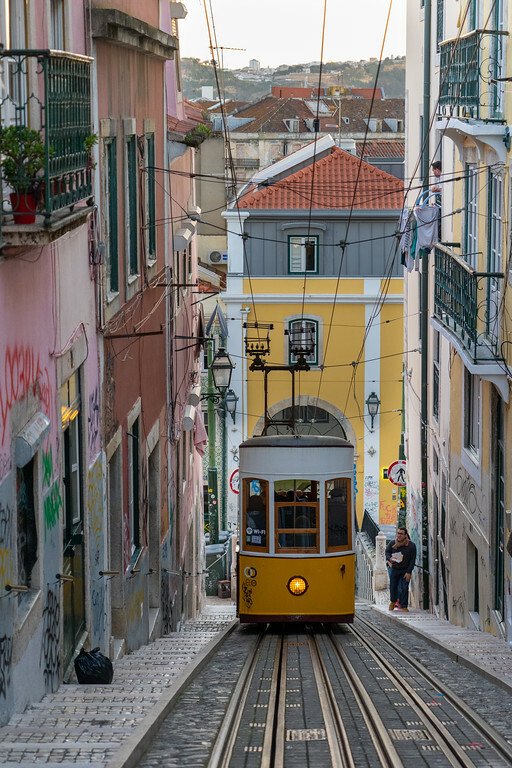 Lisbon is known for its hills and steep streets – meaning that its historic funiculars are not only highly-photographed, but also regularly used for getting from Point A to Point B. You can easily visit two of the most famous funiculars in the city this afternoon. 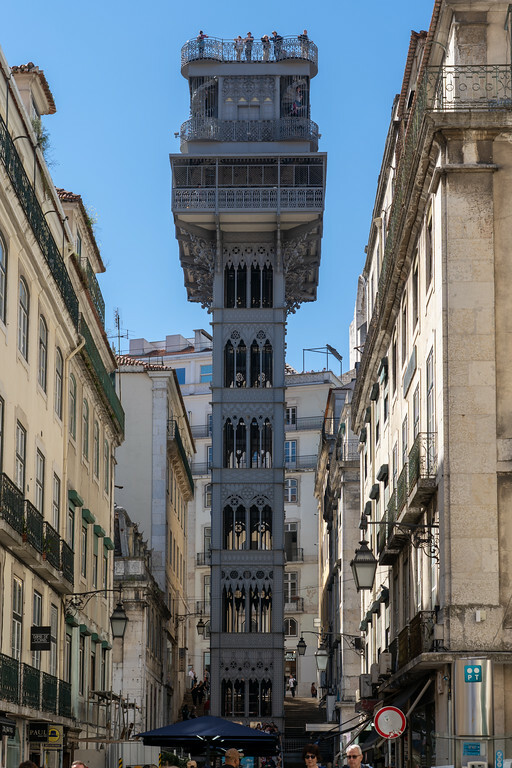 Head back up past Rossio Square (either walk, or hop on the metro to Restauradores station), where you'll find the lower station of the Ascensor da Glória at the corner of the Avenida da Liberdade and Calçada da Glória. 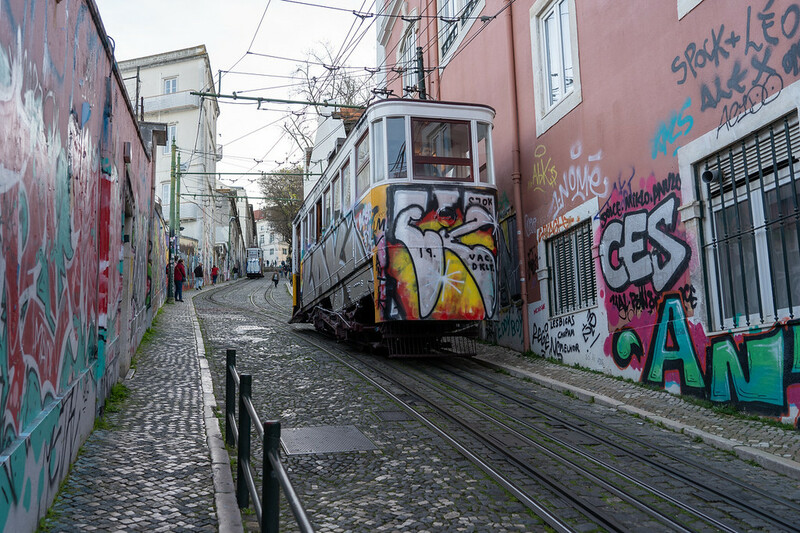 This funicular (also sometimes called Elevador do Gloria) connects Restauradores Square with the Bairro Alto, another of Lisbon's oldest neighborhoods. It dates back to 1885, and is used by both tourists and locals. At the top station, you'll find the Miradouro de São Pedro de Alcântara. This miradouro offers up great views of Bairro Alto, Chiado, Alfama, and the Castelo (though when I visited in early 2019 it was under construction, and a fence obstructed most of the view). After enjoying the views a bit, it's time to stroll through Bairro Alto to Lisbon's most-photographed funicular: the Ascensor da Bica. 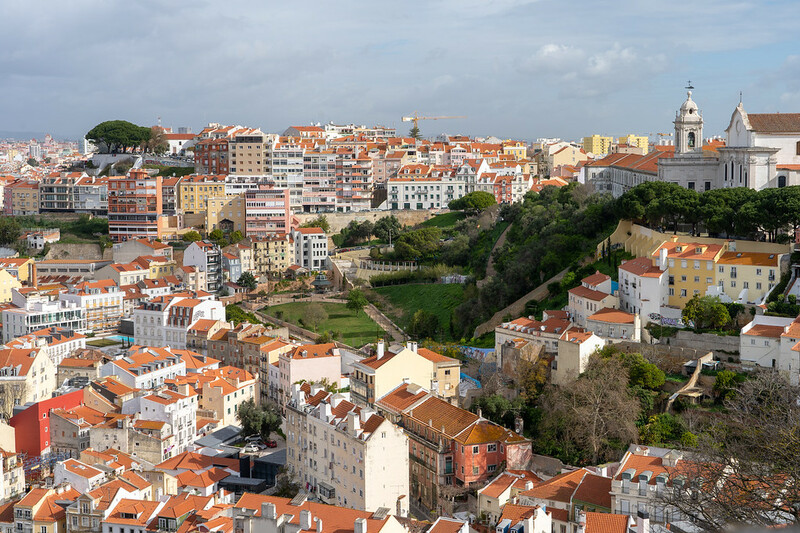 Walking from the Miradouro de São Pedro de Alcântara will take you about 15 minutes (and don't worry – it's mostly downhill!). 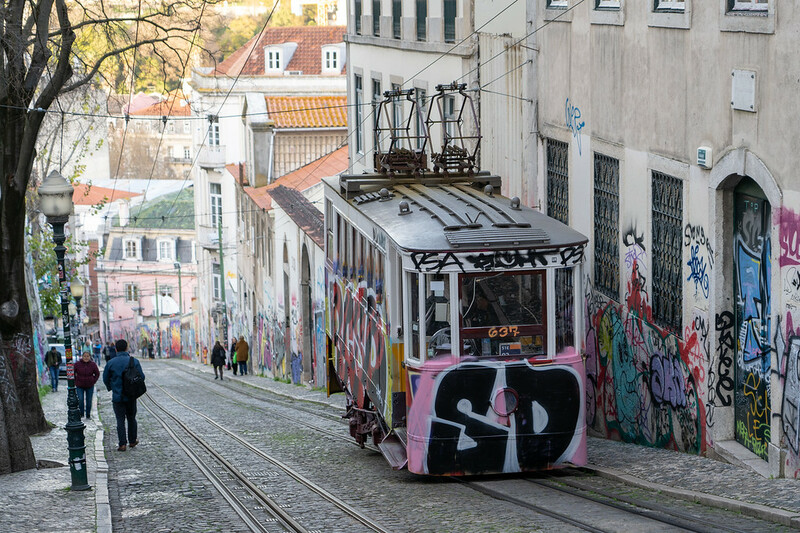 The Ascensor da Bica connects Rua de São Paulo and Largo do Calhariz, traversing one of Lisbon's steepest hills. This is likely the tiny funicular you've seen in photos – I can confirm that it can be extremely busy, especially on weekends. You can either take the funicular down (it runs roughly every 15 minutes), or walk down alongside it to snap some photos. At the bottom, you'll be in the Cais do Sodré neighborhood. 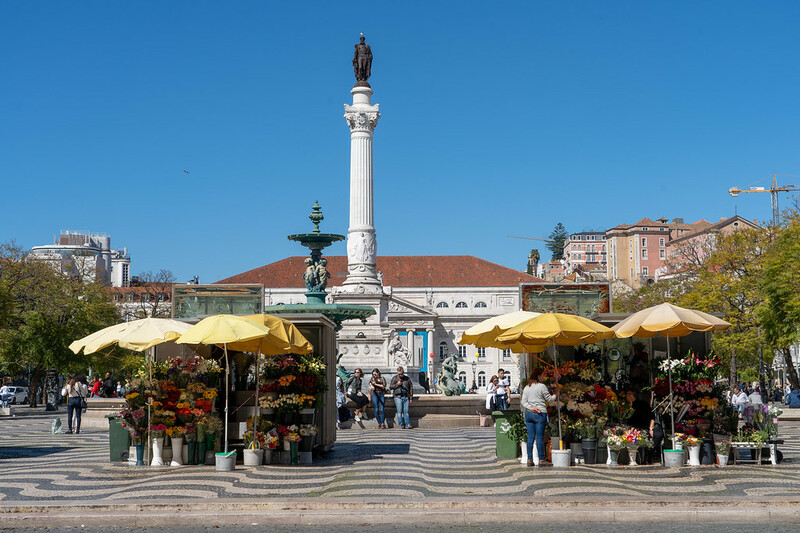 Since you'll essentially already be right there, spend the evening enjoying Lisbon's incredible Time Out Market for dinner. 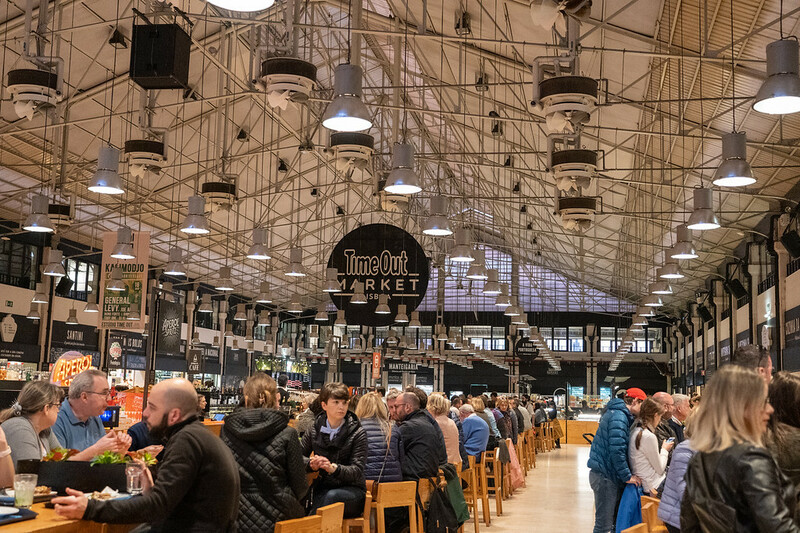 This is Lisbon's most popular food court – but don't let the “food court” descriptor fool you; you can find some of the city's best food at the Time Out Market. The concept of the Time Out Market is “bringing the best of the city under one roof.” Here you'll find roughly two dozen restaurants, a handful of bars, and even artists represented. You can have your own progressive dinner here, trying appetizers, mains, desserts, and drinks from various different vendors. 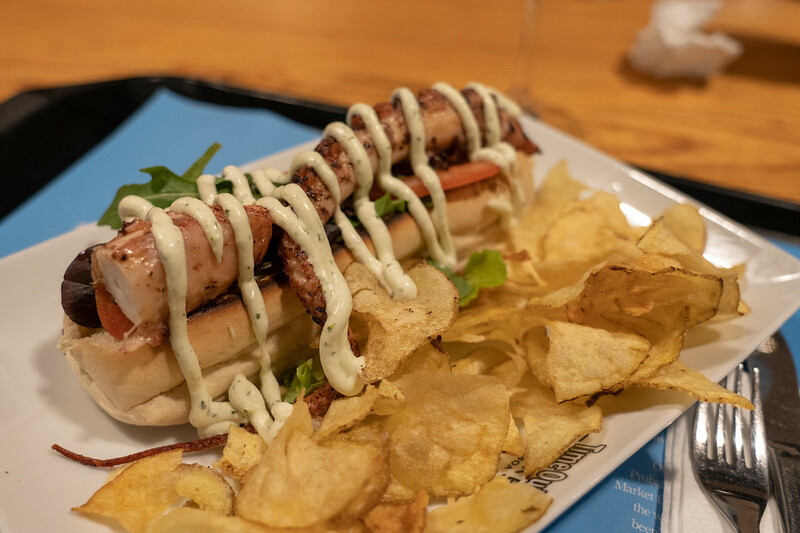 I had an octopus “hot dog” from one of the best seafood places in Lisbon! This is an excellent place to visit as a solo traveler, too, since the seating is all communal and reservations aren't required. You've hit all the top spots in downtown Lisbon, so today we'll head a little further out to delve a bit more into Portugal's interesting history. 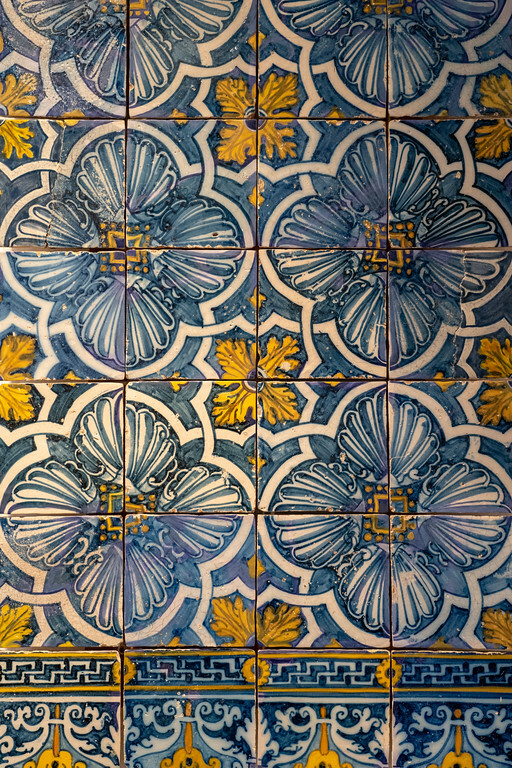 I'm not sure why you don't hear more about the National Azulejo Museum in Lisbon – it's an incredible museum dedicated to the art of tilework in Portugal. The museum only costs 5 Euro to enter, and is housed in the former Convent of Madre Deus, which dates back to 1509. 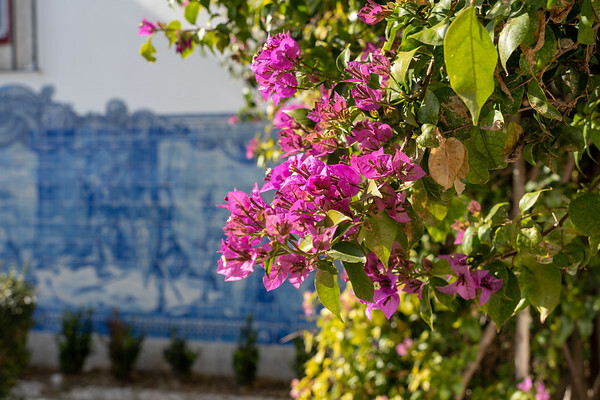 Inside, you can learn about the tradition of azulejo (tile) in Portugal, and see many beautiful examples of it. 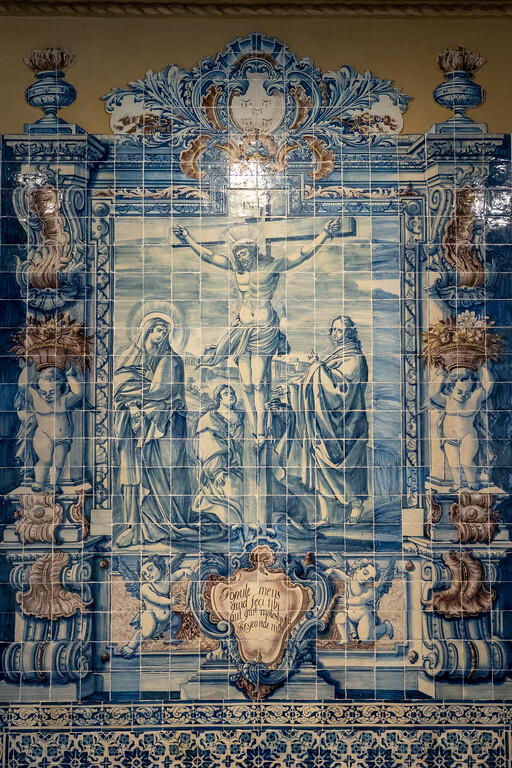 The best part is that you can also go inside the former convent's church, which is a stunning example of Portuguese baroque architecture (complete with tiled walls, of course). I'm a big fan of both history and architecture, so this was a surprise favorite for me! If you remember anything about your early world history classes in school, you might remember that Portugal used to be known for its explorers. 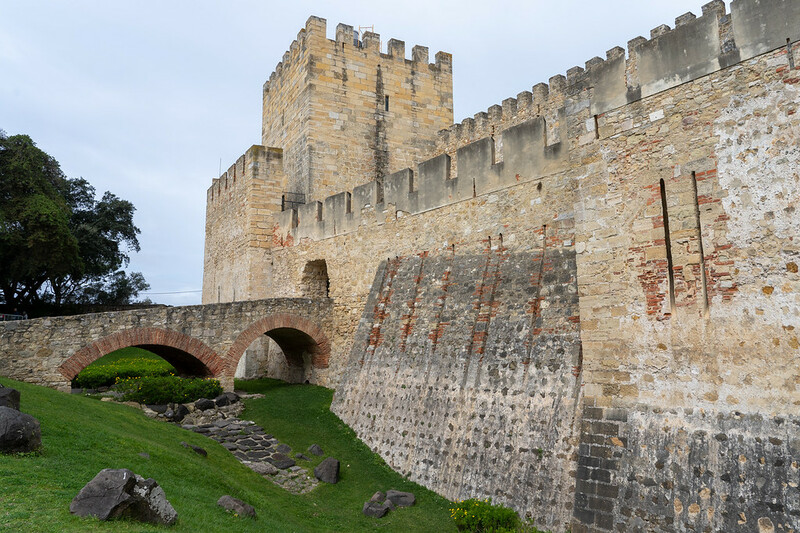 To get to know this part of Portugal's fascinating history, you need to head out to Belém. Belém is technically part of Lisbon, but really feels like a different town. It lies to the west of central Lisbon on the Tagus River, and is a great place to spend half a day. You can get there by Uber, tram, or by taking a train from Cais do Sodré. I visited Belém on a walking tour, but you can easily go on your own. 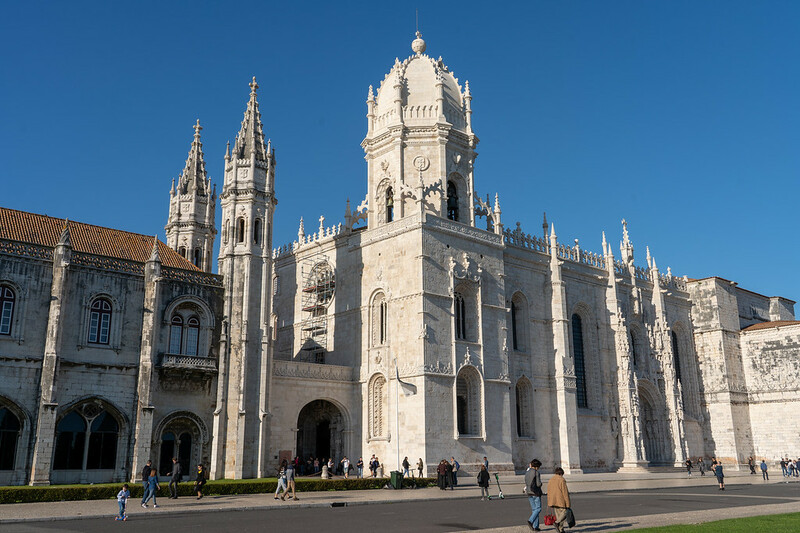 Your first stop in Belém should be the Mosteiro dos Jerónimos (Jerónimos Monastery). This incredible building dates back to the 16th century (it somehow survived the 1755 earthquake! ), and was named a UNESCO World Heritage Site in 1983. It is one of the best examples of “Manueline style” architecture, which was essentially made up by King Manuel I. He blended his favorite architectural styles – including Late Gothic, Mudéjar, Italian, and more – into his own ornate style. 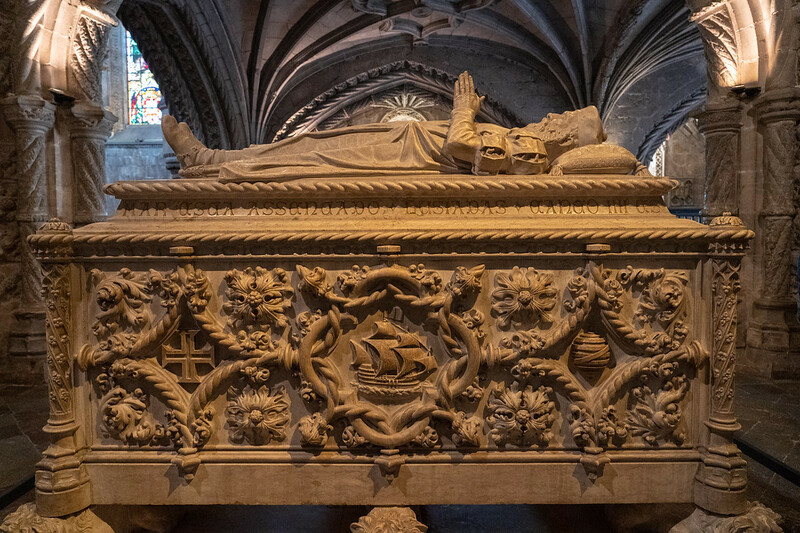 You can visit the main chapel (where you'll find the tomb of navigator Vasco da Gama) for free, and/or visit the monastery itself for 7 Euro. 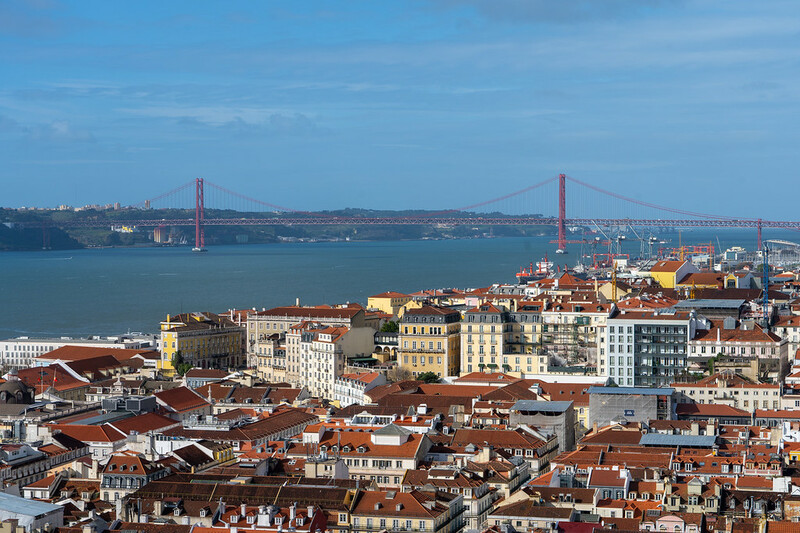 After the monastery, head for the riverfront and the Padrão dos Descobrimentos, or Monument of the Discoveries. 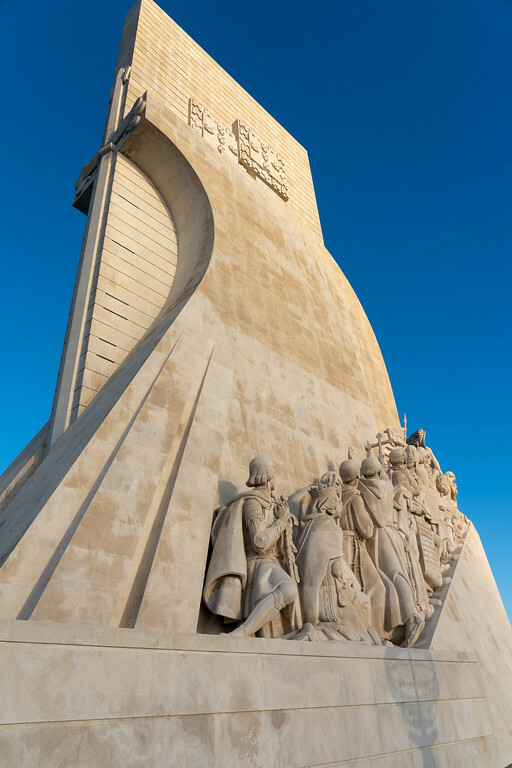 The current monument was completed in 1960, and celebrates the Portuguese Age of Exploration during the 15th and 16th centuries. 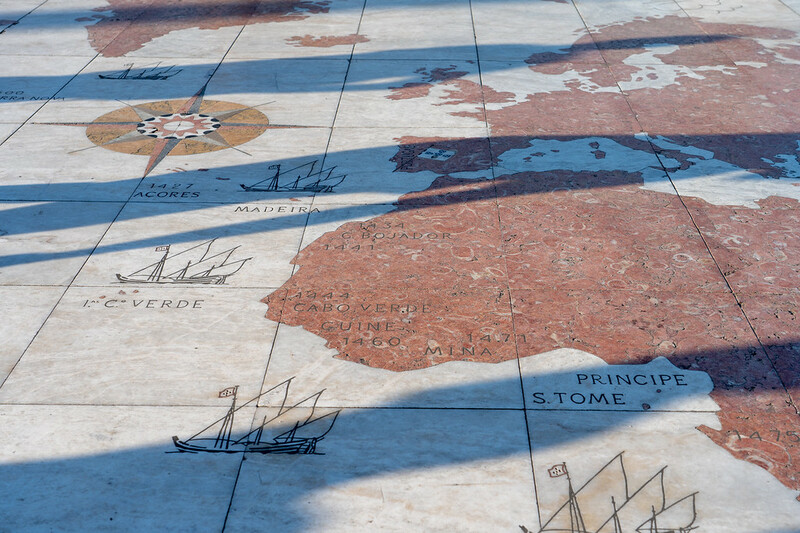 The Portuguese were excellent navigators and ship builders (Christopher Columbus came to study navigation here in Lisbon), and reached many parts of the world first. Their colonial influence lives on in places you might not even realize, from Brazil (which still speaks Portuguese) to India (the British were “given” India by Portugal) to Malaysia and Macau (where many people still speak Portuguese). Did you know the Portuguese were the first to sail around Africa? 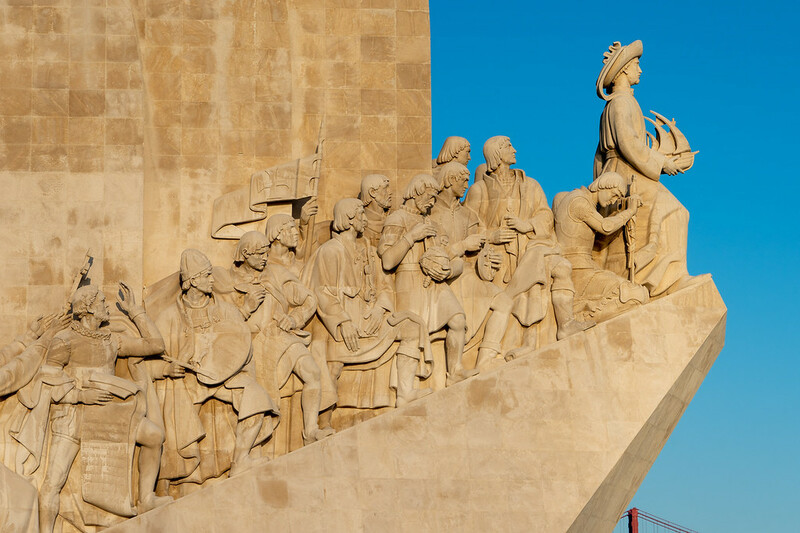 From the Monument of the Discoveries, you can walk along the Tagus to the Torre de Belem. 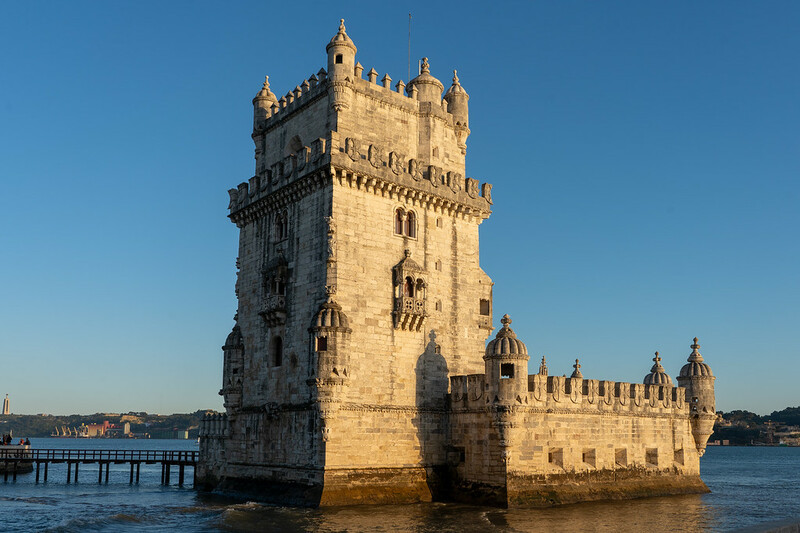 Another example of Manueline architecture that survived the Lisbon Earthquake, Belém Tower used to guard the entrance to Lisbon's harbor, and would have been the last part of Portugal many sailors and navigators saw as they set out on their voyages of discovery. Once you've had your fill of exploration, head back into Belém for a snack – a custard tart, to be exact. This Portuguese staple was “invented” here in Belém, and the original bakery still stands. Meaning you can't leave without picking up a tart (or six) from Pastéis de Belém. The line will be long no matter what time of day you visit, but it moves quickly and is 100% worth it. Once you've gobbled down a few pastel de Belém, it might be time to start thinking about evening plans. I recommend making your way over to the LX Factory, a former industrial complex that's now home to quirky shops and unique restaurants. Spend some time wandering around (the Ler Devagar bookstore is an Instagram favorite), and enjoy dinner somewhere here or nearby. This should round out an excellent 3 days in Lisbon. 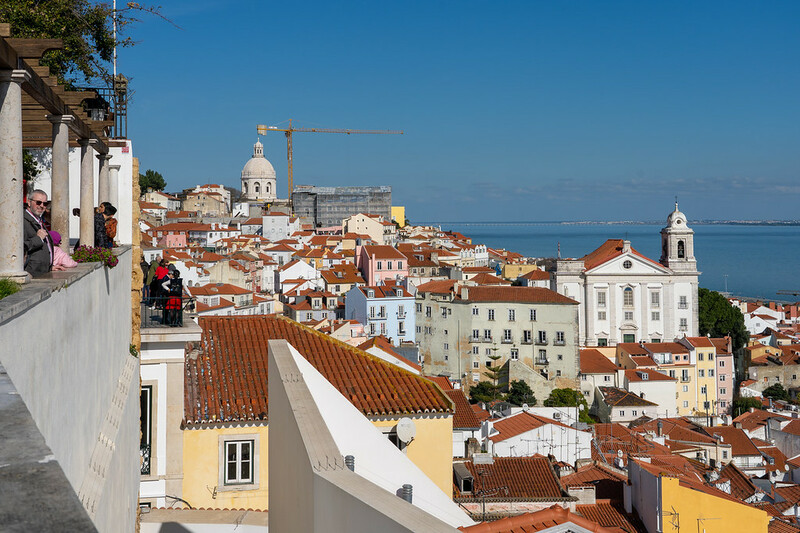 Lisbon is a year-round destination (remember all those sunny days?? ), but there are certain times I would probably avoid. Late June through August is the busiest, hottest time of the year in Lisbon, and would not be my first choice of when to visit. It's also busy over the winter holidays. I would say the best time to visit Lisbon is in the shoulder season: spring and autumn. I visited in early March, when it was starting to warm up but wasn't anywhere close to hot yet. I'd say mid-March through May, and September-October are probably the ideal times to go to Lisbon. If you have no choice but to visit during the summer, I would plan your 3 days during the week and avoid weekends. If it's your first time in Lisbon, I recommend staying central. 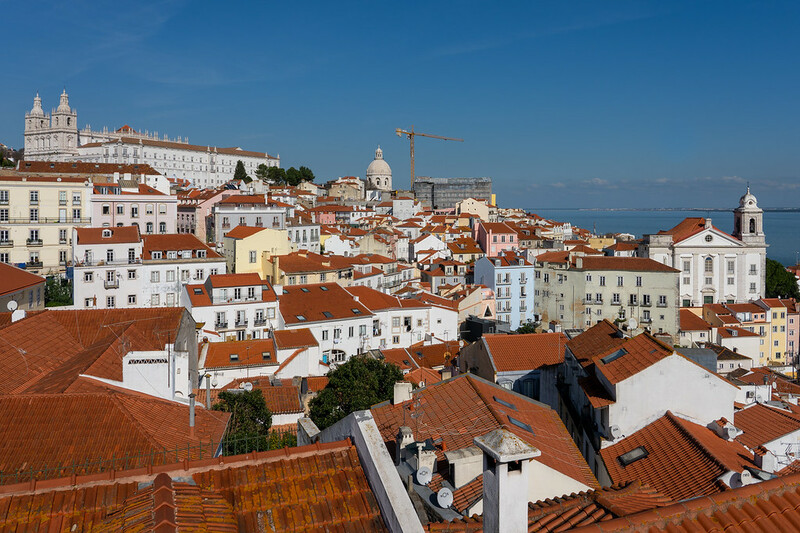 Alfama and Baixa-Chiado are the most popular neighborhoods to stay in. 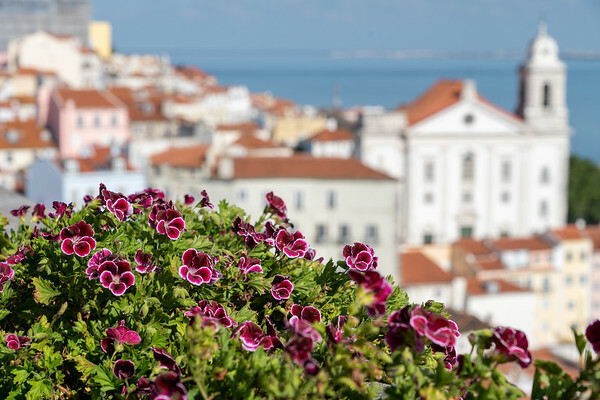 Memmo Alfama Hotel – One of the more famous hotels in Alfama, known for its terrace and red rooftop pool. 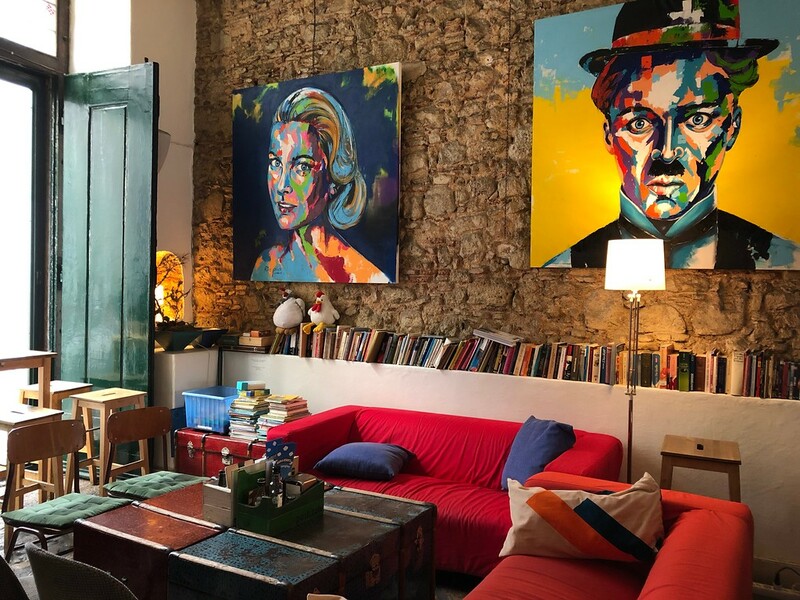 BE Poet Baixa Hotel – Right on Rua Augusta in Baixa, this boutique hotel is an excellent and affordable option for a stay in Lisbon. The rooms are comfortable (the double-glazed windows are great), the staff is SO nice, and the breakfast buffet is top-notch. This is where I stayed in Lisbon! 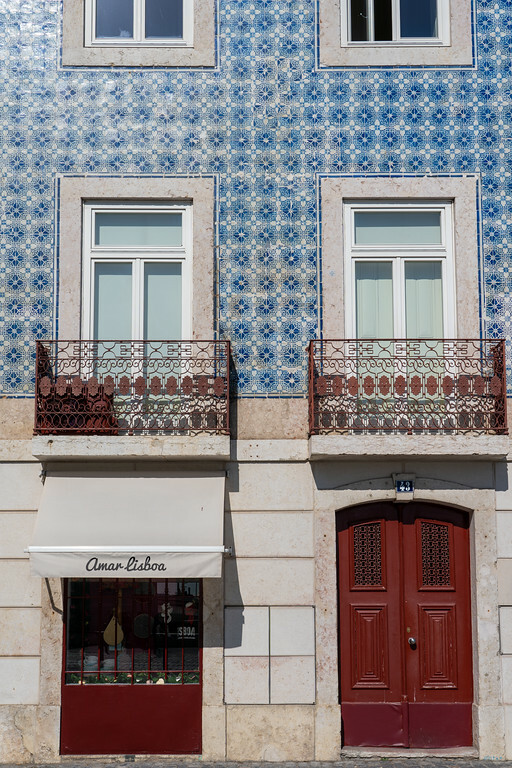 Hotel da Baixa – A mid-range boutique hotel in the heart of Baixa, and also one of the top-rated hotels in the city. *A note for the Baixa neighborhood: It's safe (I had no issues even when out alone at night), though don't be surprised if you're asked if you want to buy marijuana while walking around. And the hosts/servers at all the outdoor restaurants along Rua Augusta WILL approach you and try to get you to look at a menu. But they'll usually leave you alone if you just say no. Corpo Santo Lisbon – This is the #1 rated hotel in Lisbon on TripAdvisor. It's located near Bairro Alto and Chiado, within walking distance of the riverfront and Time Out Market. Heritage Avenida Liberdade – Another top-rated hotel, this historic property is part of the Lisbon Heritage Collection. 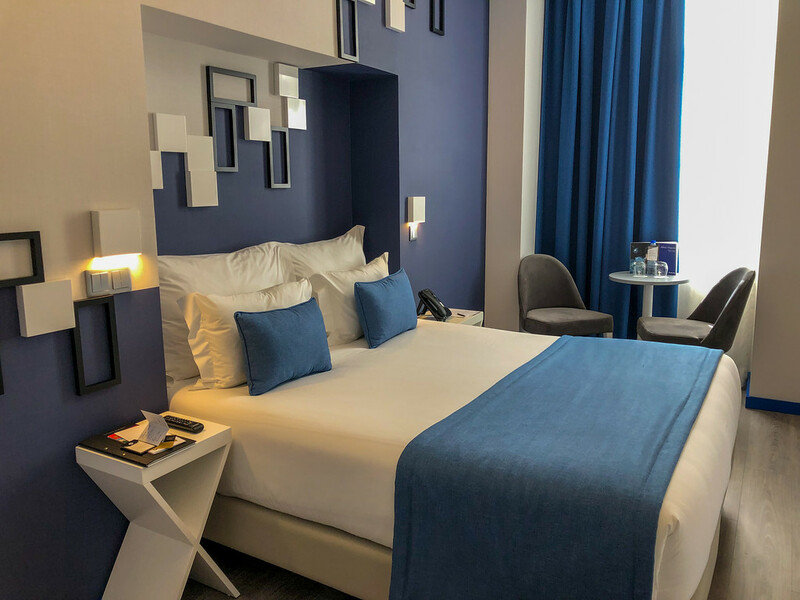 TRYP Lisboa Aeroporto Hotel – If you need a hotel near the Lisbon airport, this TRYP hotel is a great choice. It's clean, affordable, and within walking distance to both the airport and the airport metro station (though they also offer a free shuttle). I stayed here in Lisbon, too. Walking – Walking is free, and you can reach most places within central Lisbon on foot – as long as you don't mind lots of hills. Public transport – Pick up a Viva Viagem Card at any metro station. You can load up a certain amount of money and then “zap” it off your card, or buy a 24 hour pass for unlimited rides for 6.40 Euro. Your Viva Viagem is valid on the metro, as well as all buses, trams, and funiculars in the city, and public transport here is overall easy and safe. Uber – Ride shares are extremely affordable in Lisbon; I never paid more than 15 Euro to go anywhere – including catching an Uber from the airport into the city center! Most rides will be around 5 Euro. Have you been to Lisbon before? If not, what would you be most excited to see/do there? River Cruising with AmaWaterways: What's It Really Like? 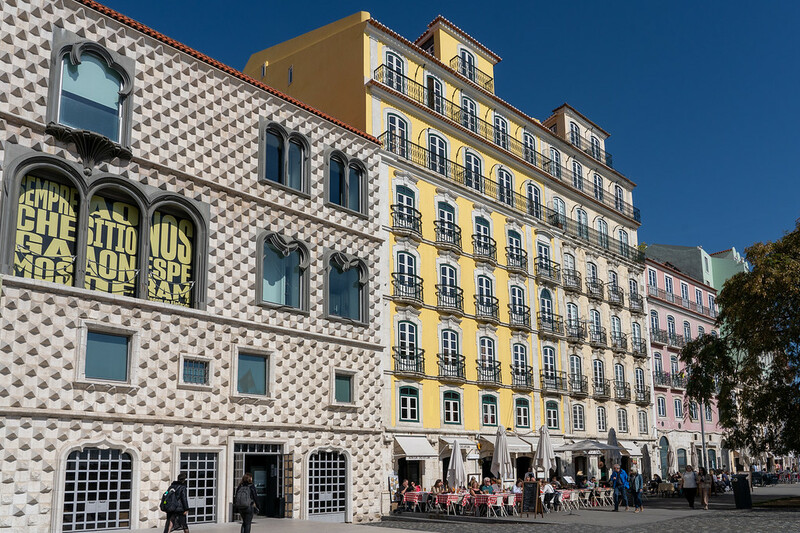 I haven’t stayed at that hotel myself, but it’s very highly rated and is in an excellent location right near Rossio station. Your plan sounds great! I hope you’ll be visiting Sintra on your day out into the countryside – it’s incredible! Do you mean the castles in Sintra or the one in Lisbon? If you’re visiting Sintra on a tour, then I think that would be covered. In Lisbon, I only did a guided tour to Belem; everything else (museums, castles, sightseeing, etc.) I did on my own. All my tips for Lisbon are in this post! Donwe need a guide for castles in Lisbon or places outside Lisbon? 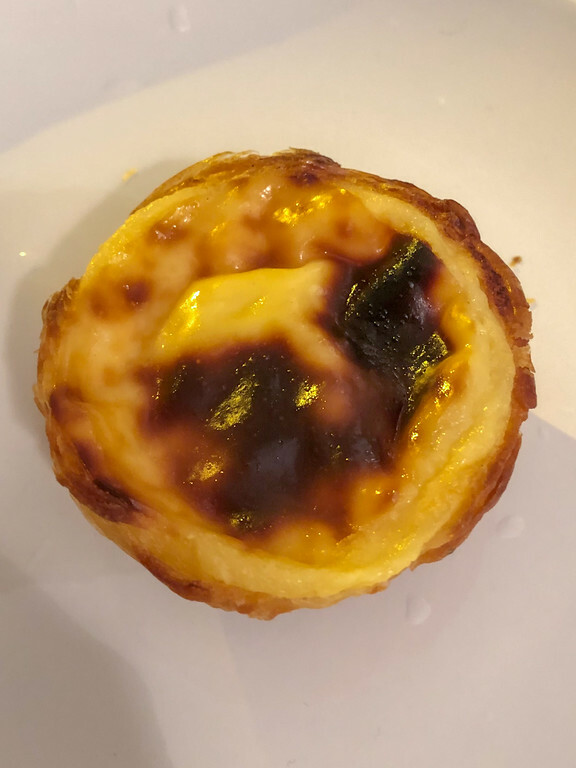 Earlier today, I came across an article on bloomberg.com about how Portugal’s custard tart is getting attention. Those custard tarts are amazing – I had at least two per day while I was there! I am off to Lisbon 29th April for 3 whole days and it is as if you knew!!! I’ll be publishing a whole post about Sintra next week! I could not get enough of those custard tarts! And I’m glad to hear you made it to the Azulejo museum – a lot of people miss it, but it’s so great! Patricia, it’s featured in this post (check out Day 3)! 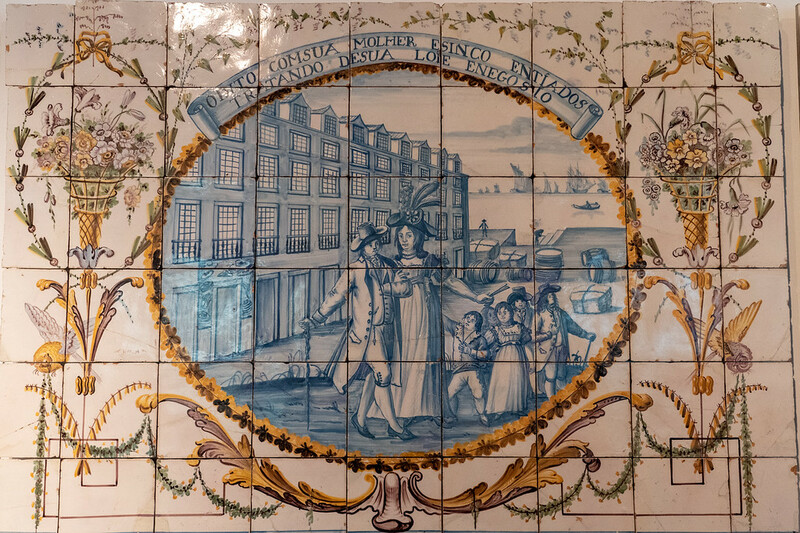 It’s a museum about the azulejo tiles (painted tiles) that you find all over Portugal. Thanks so much love times will go!